Camping is considered to be one of the best recreational activities that you can do. Being one with nature and actually experiencing the sights and the sounds do wonders to your biology and most especially, your psychology as well. This activity allows you to disconnect from the busy world and be one with nature. If you want to experience this, then please read on and discover camping essentials for 2018. Although the activity is quite good, there are some things that you need to be getting first to ensure that you will have an amazing camping experience. When you’re going to a location that is foreign or new to you, then you will definitely need a map and a compass. Having an accurate map will guide you through your destination and so that you will not get lost. However, there are some maps that are a bit difficult to read and you might end up getting lost in the process. For that purpose, you will need a compass. A compass is an amazing navigational tool and it has been used by a lot of people since time immemorial. Of course, getting acquainted with both of these things is a must so that you will never get lost while you’re camping out. Camping outside, although a great activity for both your body and mind, can present some unwanted dangers. That is why it is imperative that you bring with you a first-aid kit. Of course, there are plenty of things you can put in the kit, but these are to be the most essential ones. Before heading out, be sure to have these with you at all times. Your source of heat could be a match or a lighter. If you want a more traditional approach, you can get a flint and some kind of flammable material (although, this will take time, but this provides more fun than the previous recommendation). Next is the wood. Some of the most common wood used for campfires are Oak, Maple, Ash, and Beech. They tend to be the best ones since they’re dense and they can last for a pretty long time. Fuel is also important when it comes to creating a campfire. When you’re burning wood without fuel, you will need a ton of matches/lighters/flint and a ton of patience. Having fuel on hand can greatly diminish the time it takes to create a sizable and usable campfire. Lastly- air is also important and the beauty is that, well since you’re outside, it is abundant. Just make sure that the air is not too much or the fire will get pretty strong, thus, burning the wood at a much faster rate. When you’re outside camping, there are times where the weather is not favorable for the occasion. Sometimes, you will experience heavy rains and strong winds. For this purpose, it is therefore important to good quality waterproof tarps with you.These tarps will ensure that water will not go to your tent. Furthermore, it will protect your base whenever harsh elements attack. Ropes are also essential since you will be using them to set up your tent, install your tarps, and secure your belongings. If you’re out there to camp, it is best that you bring with you some proven and tested bug repellents. There are plenty of bugs in the wilderness and you might even have allergic reactions to certain bug bites. Aside from bug repellents, you can also bring with you some Citronella Candles. These candles not only repel insects, they also create that amazing mood and atmosphere; perfect for use during the nighttime. As a human being, you will always want a place to stay, especially when you’re out in the wilderness camping. Tents and sleeping bags are just some of the most essential camping gears out there. For the tent, make a head count first on how many people you want inside the tent and then get one that is one person bigger than your group. For example, if you and your family are going and you are 4 in total, get a tent that can accommodate 5 people. For the sleeping bags, make sure to get one that is adjustable for that maximum comfort. Also, make sure that it provides enough insulation as it can get pretty cold out there. We all must eat every day to ensure our survival and we must also hydrate ourselves often as well. Because of that, you must bring with you some non perishable food and some bottled water as well. Fruits and Vegetables (get ones that do not spoil so easily such as Carrots, Potatoes, Apples, Lychee, Oranges, just to name a few). For the bottled water, bring with you enough that will last until your last day of camping. Always remember to keep yourself hydrated to avoid dehydration. Of course, you need to wash yourself, your gear and utensils, and you will also need to take a dump from time to time as well. Never forget your toiletries and your toilet paper. For the toiletries, you need to have some liquid soap for cleaning, another soap for bathing, toothbrush, and toothpaste. Of course, you can bring with you some more if you want, but I find the aforementioned ones to be the most important. You always want to have your camping adventure to be a memorable and fun one. So, what better way to enjoy your time out there than to play some games? There are plenty of games you can do while you’re camping. Some ideas are Scavenger Hunt where you hide different items for people to look for, a campfire relay where two teams fight and see who creates a campfire first, and so on. Be creative with it and use the items and gears that you currently have to make your adventure worthwhile and engaging. You need to bring with you a cooler and some ice. The cooler can act as your fridge since you will be storing your ice in there and it will keep the cold inside as well. You put your drinks and food inside to protect it from unwanted agents and so that they will remain great for consumption during your entire stay in the wild. Camping is a great and fun recreational activity. 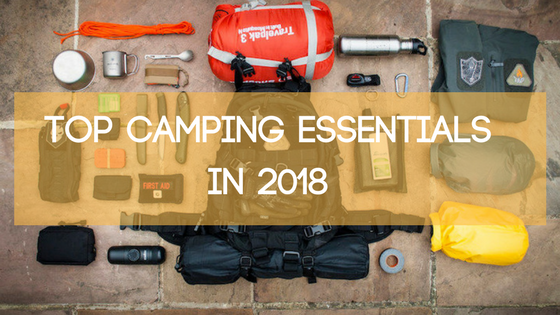 If you’re planning on going on a camping trip, make sure that you have all camping essentials that are outlined above to have a stress-free adventure. As an added bonus you can grab a hammock to make it more fun but make sure you have got one of the best hammocks to avoid any surprises or damages to your health.